This is the season for all things orange, and lately my seasonal ingredients have incorporated that warm and wonderful color. Butternut squash went into a savory soup and pumpkin got tossed into a stick-to-your ribs fried rice. But for the next installment I bring you something sweet from the oven: tender pecan cookies made with sweet potato. Let baking season begin! 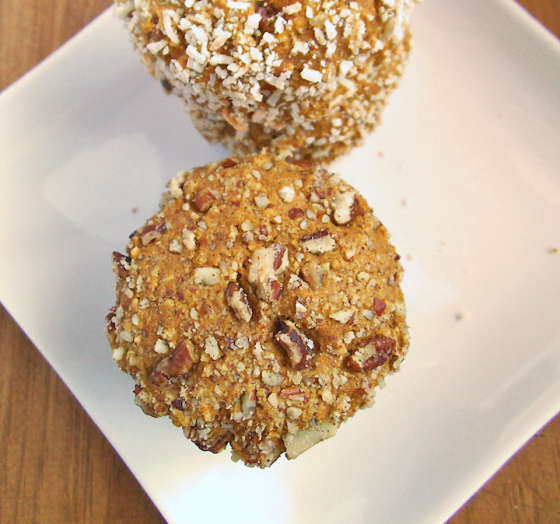 These healthier treats make an ideal grab-and-go breakfast for cookie lovers like me. Inspired by my Cocoa Nut Breakfast Cookies, this aromatic version features pecans and highlights the warm hue of the sweet potato base. My youngest daughter won’t eat chocolate, so these cookies hold maximum appeal to her, since she also adores nuts. My all-time favorite nutty cookie is Almond Supreme Cookies, but I reserve those for the Christmas season because they are sweetened with white sugar and dangerously irresistible. In contrast, when I make something sweetened with more wholesome maple syrup, my cookie cravings can be satisfied guilt free. Plus they get a thumbs up from my kids, who are often wary of gluten free goodies. And especially when it comes to baking cookies, they have to be yummy or there’s no point. 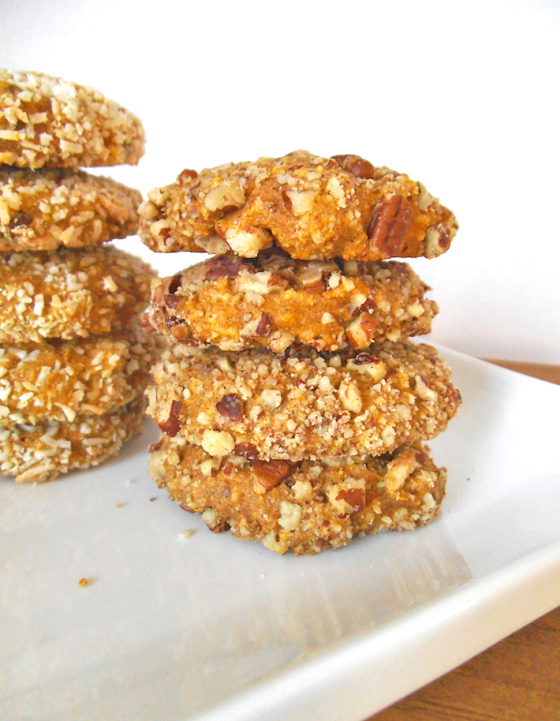 Speaking of yummy, I also have a recipe for Healthier Samoa Coconut Cookies that include sweet potato and caramel. If you’ve never ventured beyond sweet potato pie, it may be time to change that. Step away from the marshmallows and enjoy the abundance of sweet potatoes as a healthy hand-held treat. 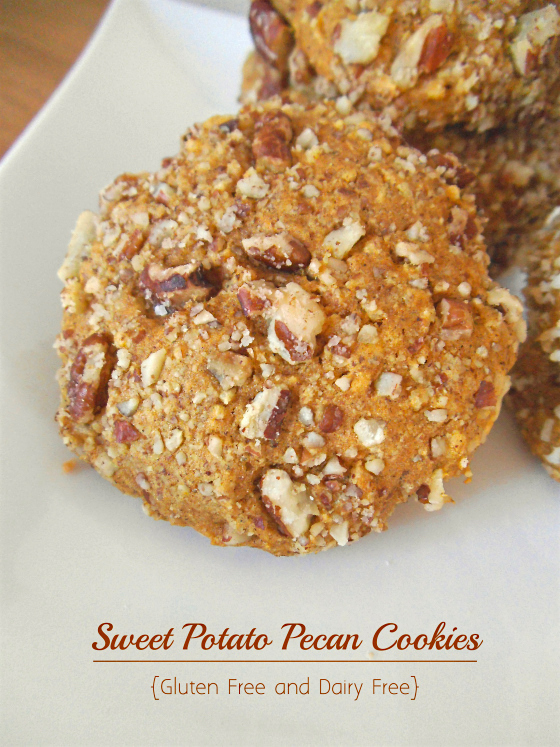 I think that once you try sweet potato cookies, you will understand why I’ve never looked back! *Alternative: use just 1/2 cup pecans and mix into the batter; then use 1/2 cup more coconut flakes for the coating. Combine sweet potato, coconut oil (or butter), maple syrup, egg, flax/chia, and sugar using food processor or electric mixer. Blend until smooth. Sift remaining dry ingredients together, except for nuts. Add dry mixture to wet ingredients and process or mix well together. Fold in 1/2 cup pecans with a sturdy spoon. Cover batter and chill for 15 minutes, until firm but not completely solid. Preheat oven to 325 degrees F (165 C). Form chilled batter into balls with a small scoop or by hand. Roll each ball in remaining pecans. Place on parchment lined cookie sheets. Press down with fork to flatten each cookie. Bake for 15 to 18 minutes. Let cookies cool completely on the cookie sheet before serving. Wrap and store any remaining cookies in the freezer. Such healthy cookies! Going to make these. When sweet potatoes and pecans come together I become a very happy camper! These look great! Yes, me too! I enjoyed some for breakfast today. Yum! they look so chewy and delicious! They are deliciously tender. If you are hoping for chewier, you might try unbleached wheat flour in place of the buckwheat.